This book is the first comprehensive coverage of the history of the American Military Saddle using actual photographs and official army drawings of original saddles and other horse equipments. In chronological order. the history of each specific area is covered in its own chapter with fresh, insightful text based on in-depth research and period military documentation. 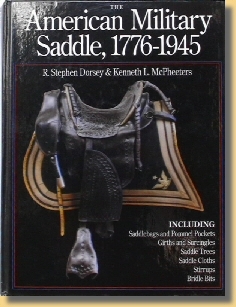 SADDLES; SADDLE TREES; SADDLEBAGS; CANTLE BAGS and POMMEL POCKETS; BRIDLE BITS; STIRRUPS; SADDLE CLOTHES and SHABRAQUES; GIRTHS and SURCINGLES - they are all comprehensively covered from the earliest days of the Revolutionary War to the final dismounting of the US mounted troops after World War II. THE AMERICAN MILITARY SADDLES, 1776-1945," provides a wealth of documented data and detail on US military horse equipment that has never before been available in a single nor series of books on the subject It is the new standard reference work that will be indespensable for the collector. student researcher, museum and dealre for years to come. Easy to use and comprehensive in coverage. THE AMERICAN MILITARY SADDLES, 1776 - 1945," answers many questions about design, construction, modification, production and production facilities. issue and disposal of horse equipments through our nation's history. And. importantly. it provides insects into the reasons for the adoption and changes of these equipments over time while entertaining the reader's interest while a well-told narrative. An exciting news addition to the collector's and researcher's library! "The 1913 Mule Riding Saddle"